Withdrawn between Farnborough and Knockholt Pound for winter months. Daily TL allocation introduced. This was part of a complicated round of re-allocations connected with the opening of PM garage. Briefly though the gap at Bromley was covered by the 227 and the Route 36 was transferred from TL to PM making room for the 47. Withdrawn between Farnborough and Knockholt Pound for good. D changed from RT to RTL. Daily extended from Shoreditch to Stoke Newington as part of the Trolleybus Replacement program. Monday-Saturday extended from Stoke Newington to Stamford Hill and from Bromley Garage to Farnborough replacing part of withdrawn 199. Saturday pm and Sunday evenings withdrawn between Shoreditch and Stamford Hill. Saturday TB allocation withdrawn. RM type allocated to D at weekends. Monday-Friday D allocation withdrawn. Monday-Saturday CT allocation introduced. Monday-Friday D allocation re-introduced.. Monday-Saturday CT allocation withdrawn. RM type introduced on a daily basis. D garage closed - allocation moved to AG. Withdrawn between Bromley Garage and Farnborough - replaced by New 261. AG allocation withdrawn. A weekend allocation re-introduced at TB. RM vehicles at TB replaced by T crew buses. 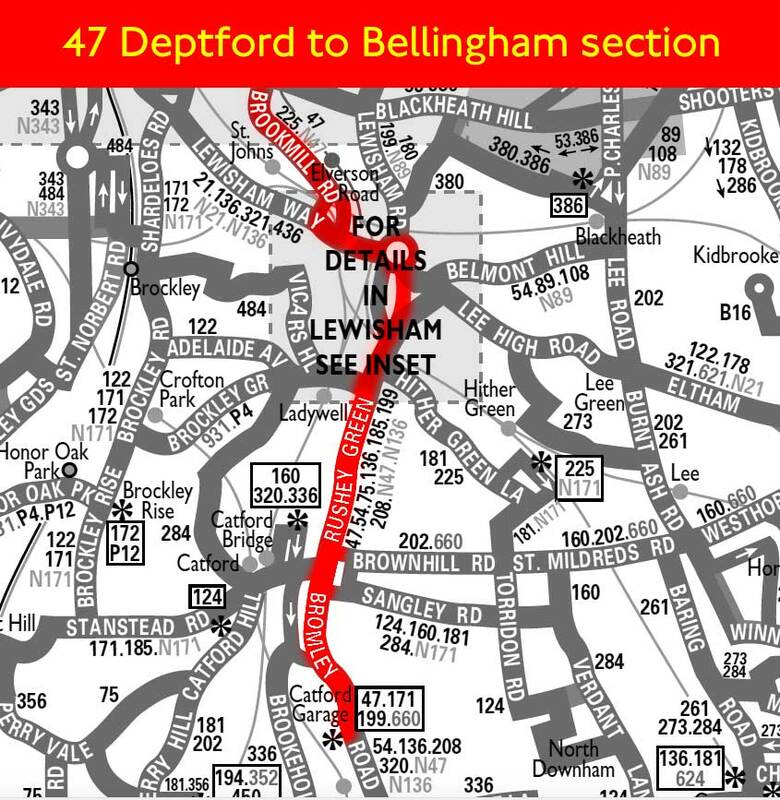 Withdrawn between Downham and Bromley - withdrawn section covered by new 47A. Withdrawn between Catford Garage and Downham. Volvo VN107 seen at ? Photo taken at Gracechurch Street/Leadenhall Street Dec 2014. Frequency decrease on supplementary service - date withdrawn ?